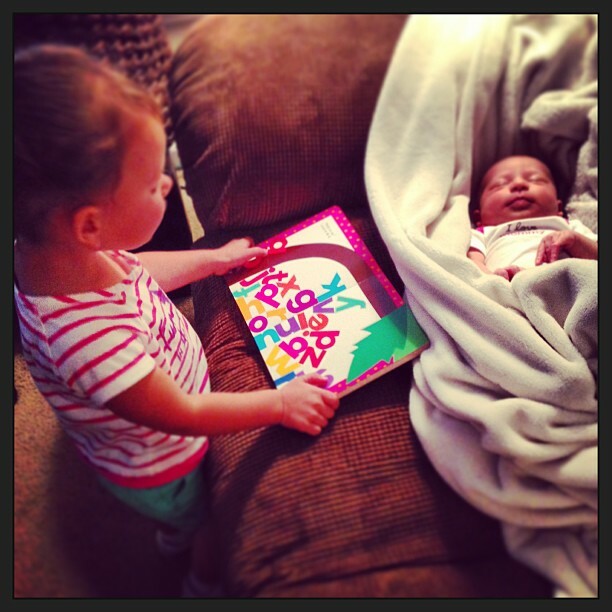 Sophia reading to Maddie while Maddie sleeps. I knew going in that having a second baby was going to severely impact the amount of sleep that we would get. We didn’t get a ton of sleep when Sophia was a baby, but compared to now, we got WAY more sleep than we’re getting now. Everyone we know that has more than one kid has told us that the biggest change is going from one to two, and then going to more than two is a breeze. I honestly can’t see how that’s possible, but what do I know? Limiting our sleep was the fact that Maddie has reflux, so getting her comfortable at night after a feeding was extremely tough. To make that worse, somehow she got a cold and was congested, so she could get even less comfortable, if that’s even possible. It was as if we were up every hour and would get maybe an hour or two of sleep a night. This lasted for about two weeks. It was so bad that I may or may not have dozed off for a minute on my keyboard in the middle of the day for a minute. Thankfully, medicine and a vaporizer have helped keep Maddie more comfortable at night and allowed us to get some sleep.